This product is prepared by labeling highly cross-adsorbed rabbit anti-human IgG (H+L) with a selection of our bright and photostable CF® dyes. Their unmatched photostability makes them the best choice for demanding applications, such as confocal microscopy and single molecule imaging. 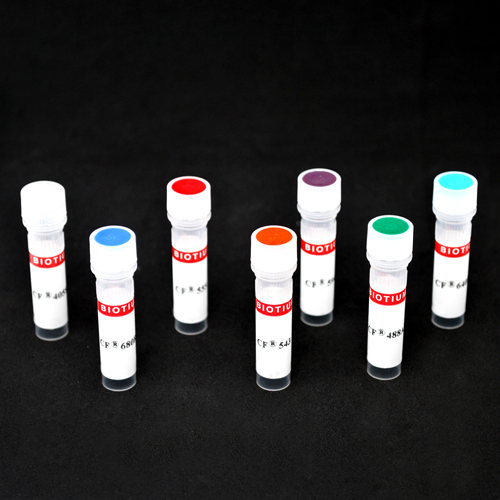 This product is prepared by labeling highly cross-adsorbed rabbit anti-human IgG (H+L) with a selection of fluorescent CF® dyes. To minimize cross-reactivity, the antibody has been adsorbed against mouse serum. CF® dyes offer exceptional brightness and photostability. See the CF® Dye Brochure for more information.